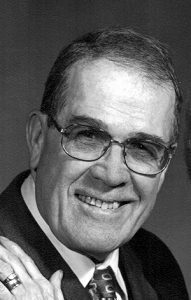 Peter Ben Carpenter, 82, of Charlotte, passed away Tuesday, January 29, 2019, at Sparrow Hospital with his family by his side. He was born September 4, 1936, in Charlotte, the son of Jay and Ivadene (Lake) Carpenter. Pete graduated from Charlotte High School in 1954. Soon after graduation, on his birthday, he married Constance J. Keeny. Together they owned and operated Connie’s Beauty Studio in Charlotte for many years. Pete was also a cofounder of Eaton County MS Support Group. He also worked as a salesman, traveling many miles selling his promotional material. Pete loved serving others. Pete volunteered with Mobile Meals in Charlotte for many years and could often be found lending a helping hand to anyone in need. He also had a passion for bicycling. Pete rode in many DALMAC events throughout the years. You will be greatly missed, Petey the Sweetie. Pete is survived by his wife of 64 years, Connie; children, Debra (Roland) Williamson of Loveland, Colo., Anne Carpenter of Charlotte, Stacy (Ike) Fry of Mason; six grandchildren; and eight great-grandchildren. He was preceded in death by his parents; and brother, Daniel Carpenter. In keeping with Pete’s wishes, cremation has taken place and no services will be held. Those desiring, may make contributions in Pete’s honor to the Mulitple Sclerosis Foundation, 6520 N. Andrews Ave., Fort Lauderdale, FL 33309. To view Pete’s obituary online or to leave a condolence for the family, please visit burkhead-greenfuneralhome.com.